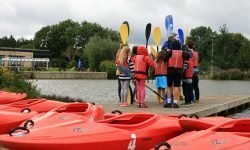 Friday 14th October saw a group of young people from Acklam Grange School in Middlesbrough visit the Hub to enjoy some of the outdoor activities on offer. The group of 12 shared their time between excitement on the high ropes and fun canoeing on the lake. Two highly experienced and qualified instructors gave the young people tuition and instruction, ensuring their safety whilst providing the opportunity for each to push themselves out of their comfort zone and achieve what they had thought impossible at the start of the day. The activities were designed to be challenging but with teamwork and trust, achievable. It was a fantastic morning, despite the miserable autumnal weather, with some great personal achievements. Facilities at the Hub are available to all to book. Please speak to Jonny or Laura on 01833 690150 or email info@tcrhub.co.uk .